If you haven’t read X-Men in a while, are new to the merry mutants, or are just looking for something different, Mike Carey’s Age of X storyline taking place in X-Men: Legacy and New Mutants right now is not to be missed. I say this as someone who has to restrain herself from gushing over my desperate love for Carey’s writing and all the work he’s done on the X-Men since taking over Legacy back in 2008. Can you believe he’s been on the book that long? It’s rare these days to see a run last this long, and there happily seems to be no end in sight for Carey’s. It’s not hard to see why, under Carey’s pen, X-Men: Legacy is selling the best it has in a long time. But that’s just backstory. What makes Age of X so special? Pick up Legacy #245 and you’ll see exactly why. Firstly, let’s clarify one thing: this is not a re-telling of Age of Apocalypse, for anyone who might think it such. This is something entirely different. These are the X-Men had the Professor never been around to unite them; had there never been a School for Gifted Youngsters; had none of these characters ever met in the ways they did. There are infinite possibilities, of course, to tie the X-Men together, be it through friendship, family ties, romantic ties, and the like. Carey, then, takes this open canvas and presents to us just one of the myriad ways the X-Men could have come to be. Continuing from where the previous issue of Legacy left off, Blindfold’s warning of something horrible coming to tear the X-Men apart has come true in a way no one expected. Exactly how and why the world has turned into what it is now is unclear; Carey instead chooses to open up the story by throwing us right in the middle of the action, rather than provide answers and clarification. From a technical perspective, this approach works much better than laying it all out on the line—I’d rather try to figure things out on my own than have the narrator tell me “This is this, and here’s that, and that’s because of this,” etc. The golden rule of writing is “show, don’t tell,” and unlike some of his peers, Carey’s got that method well mastered. We start out, then, right in the middle of the fray—a group of mutants (not X-Men, because in this world, they don’t exist) have come together to seek refuge in Magneto’s creation, the Fortress. Attacked and mercilessly hunted by baseline humans, a series of events has finally brought them to stand together, but it may be too little too late. As the group ward off the most recent attack, we come to learn of their relationships both during the fight and after. Cannonball, for instance, emerges a clear leader in the field, barking orders and taking control of the situation. Gambit leads a separate group of Frenzy, Tempo, and others. 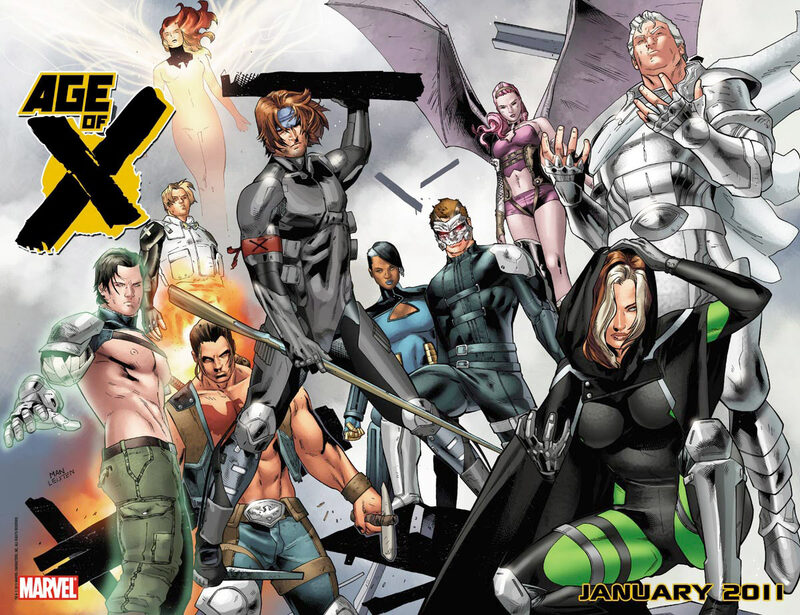 We see characters used in similar ways as their 616 versions (Storm, Iceman), and others who take on a new twist, such as Legacy, aka Reaper (Rogue), whose powers have become almost a “last rites” administration to fallen comrades. Some interesting couplings have also come to pass—Storm and Namor, for instance, or Betsy and Iceman. But the most fascinating story by far is that of Basilisk (Cyclops). Who could believe that someone could actually make Cyclops interesting? Carey’s done it, and I’d rather you read it than have me tell you why. I dare say I am a Basilisk fan. I’m also a Legion fan and a Pixie fan, apparently—not something I thought I’d say any time soon, but this is why this story is so worth your time. The new take on these characters and their relationships that have hooked me in and makes the book stand apart. The even more intriguing parts of this tale unfold toward the end of Legacy and throughout New Mutants, wherein Kitty Pryde comes into play and we discover that not all is as it seems within the Fortress. Imprisoned beneath its walls are a number of mutants deemed too powerful and “dangerous” to be let free, and you may or may not be able to guess what surprises lay there. After reading the first two parts to Age of X, I went back into older issues of Legacy to see if I could piece together any information from previous hints dropped in the preceding stories. There is a great, great line in #244 wherein Rogue speaks to Madison Jeffries and asks him if he’s getting a sense of deja vu—which will only make sense if you read New Mutants #22. The thing that makes it so difficult to review a book like this is that there is so much to address, and yet so little you actually feel you can address without “spoiling” what makes it so special. This is particularly so with regard to new readers—you’re better off coming in blind (pun!) than trying to form some sort of understanding of the plot before you read it. Where normally I’d be rioting against a story that takes place across multiple books and forces you to pick up more titles than you’d care to (e.g., Civil War, Secret Invasion, Marvel’s next big event, on and on), this one actually makes sense. You really need more than one title a month to contain this story, and you’re only picking up one extra book, rather than five or seven. And I nearly forgot to say something about Clay Mann’s pencils, which are extraordinary. Mann is quickly emerging as one of my favorite pencilers, and he is absolutely at the top of his game here. I cannot say enough good things about him. Take the leap and pick up these two titles. In fact, part three of the story was due out yesterday in Legacy, and it is beyond worth a look. If you’re used to the commonplace, stale guff that’s been going on in Uncanny lately, you’ll find energy in this book. Do yourself a favor and meet Mike Carey in Age of X. This entry was posted on 03/10/2011 by ravenhaired. It was filed under Comic books, Reviews and was tagged with Clay Mann, Magneto, Marvel, Mike Carey, Rogue, X-Men.